Hawaiian shirts are our number one product in customer satisfaction and sales. Our goal as it was when we first came online with RainbowHawaii.com in 1999, is always provide customers with Hawaiian shirts and apparel that is above industry standards at amazingly low prices for quality workmanship, selected beautiful fabric with vibrant designs that you will appreciate. Along with fast shipping and responsive customer service we built a desirable combination with our Hawaiian shirts. It is not surprising that we are passionate about providing quality Hawaiian shirts and clothing products at RainbowHawaii.com at attractive prices. A number of our friends, relatives and family sailed from China to settle in Hawaii around the 1920’s through 1980’s. Many were and are talented seamstresses and craftsman who earn their living making Hawaiian shirts and Hawaiian clothing. A quick look at history Many Classic Hawaiian Shirts were originally made from soft colorful silk fabric taken from Japanese Kimono garments brought to Hawaii from labors hired to work the sugar and pineapple plantations in the 1920's. The silk fabric of the kimono was a real eye catcher rich in color with scenic floral designs. The silk fabric was soft light cool and comfortable, a good material for Hawaiian shirts, however the cost of quality silk was a bit expensive. With the creation of rayon all the good qualities of silk could now be provided in affordable fabric and soon Hawaiian shirts would be made with this fabric. Rayon intensifies the lustrous sheen and color with good comfort and fluid drape of silk that make rayon fabric one of the most popular materials for Hawaiian shirts today. 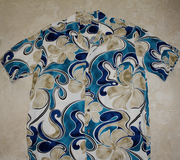 Today rayon Hawaiian shirts are made of quality soft fine and smooth soft heavy or lightweight 100% rayon. In the 1800's outside traders from America and Europe introduced cotton cloth that was colored and printed with a few simple designs. As the years went by Hawaii began to develop and soon had developed sugar cane and pineapple plantations as outside developers took control. The workers from the sugar cane and pineapple plantations as well as cattle ranchers or paniolos, (Hawaiian Cowboys) wore cotton palaka shirts which are criss-cross checkered looking print patterns with straight cut bottoms so they did not have to tuck in their shirts while working under the hot Hawaiian sun. They also cut off the long sleeves to help stay cool. And an increasing variety of colors and variations of these prints began to grow. Around the time the tourism industry was just starting around the 1920's and 30's a Chinese immigrant a tailor named Ellery Chun put together a flower print shirt on a brightly colored background and became the originator of the Hawaiian shirt what we call in Hawaii, Aloha Shirts and the Aloha print Hawaiian clothing industry was born with ever increasing colors and print designs turning out. By the early 1040's this new fashion of the islands was established as the Aloha wear industry. This industry began to grow with steady demand over the years. Today Aloha wear is made of many materials with cotton as the most popular followed by silk and other synthetics like polyester & rayon. The print designs today typically reflect the scenes you find around Hawaii with Tropical Flowers the most popular. This is the reason that almost all the Hawaiian fabric products you see here from Rainbow Gifts Hawaii are tropical flower designs. * Guaranteed Made in Hawaii! At Aloha Apparel Hawaiian Shirts we make "The Real Thing"- authentic "Made in Hawaii USA" Hawaiian shirts shipped to you from Hawaii where real Hawaiian Shirts originated! Getting your Hawaiian Shirts, Hawaii shirts, or Aloha shirts from us at Aloha Apparel Hawaiian Shirts is the smart choice!